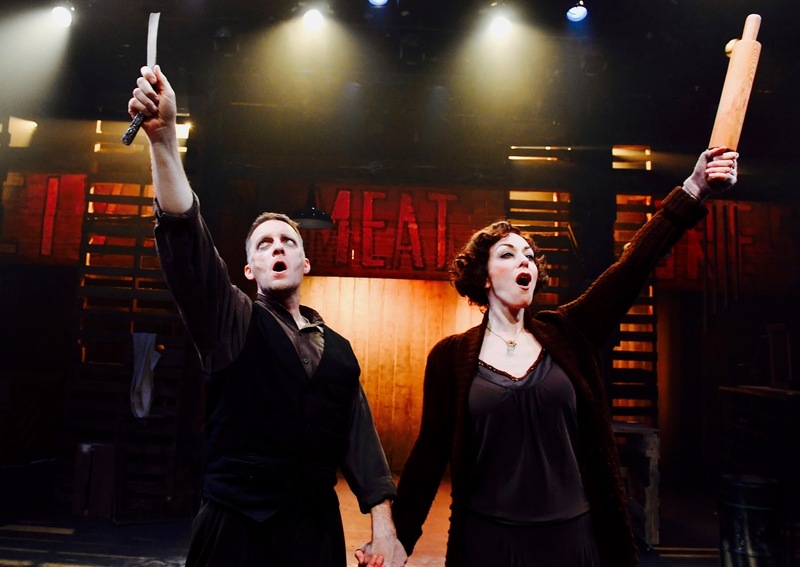 Proof that Stephen Sondheim’s “Sweeney Todd: The Demon Barber of Fleet Street” is the work of a genius lies with San Jose Stage Company’s production. Winner of eight Tony Awards, this 1979 tale of a wronged barber’s revenge has seen on stages from Broadway to community theaters. Both the San Francisco Opera and San Francisco Symphony have presented it. Although the show is traditionally set in Victorian London, this production appears to be in the late ‘20s or early ‘30s, judging by Abra Berman’s costumes. Director Kenneth Kelleher uses only 10 actors. Although many productions have used a more expansive, two-level stage, scenic and lighting designer Michael Palumbo (sound by Steve Schoenbeck) compresses the action into the venue’s small, one-level space. It works because of his design and Kelleher’s ingenious staging. While the book by Hugh Wheeler has intrinsic interest, Sondheim’s music and clever lyrics carry the show – provided they have actors who can handle them. This production has them, starting with Noel Anthony as the haunted Sweeney Todd, who returns to London after being sent to an Australian prison by a crooked judge with designs on Sweeney’s wife. Sam Faustine takes on the vocally challenging role of Anthony Hope, the sailor who has befriended Sweeney. By coincidence, he sees Sweeney’s daughter, immediately falls in love with her and sings the show’s most beautiful song, “Johanna,” in a sweet, light tenor. Supporting roles are all excellent, starting with Keith Pinto as Tobias Ragg, the disabled boy who becomes Mrs. Lovett’s assistant when her pie shop starts to thrive, thanks to grisly contributions by Sweeney. Christopher Vettel plays Judge Turpin, who has adopted Johanna. He’s impressive in the often omitted “Mea Culpa,” in which he flagellates himself over his lust for her. His smarmy henchman, The Beadle, is played by Branden Noel Thomas, while the Beggar Woman is played by Jill Miller. Both do well. Seated on the side are four musicians, including musical director Katie Coleman on keyboard. Kelleher has made a few minor omissions, but none subtract from the power of this show. Running about two and a half hours with one intermission, “Sweeney Todd” will continue through March 18 at San Jose Stage Company, 490 S. First St., San Jose. For tickets and information, call (408) 283-7142 or visit www.thestage.org.